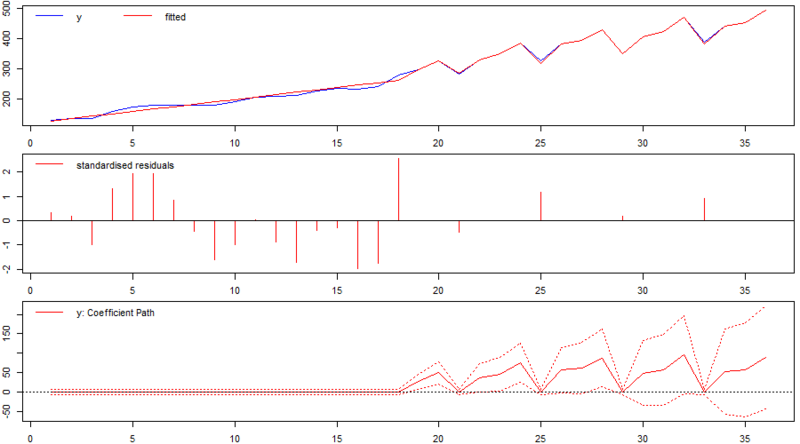 The upcoming interview with David Hendry in the International Journal of Forecasting (now published) sparked a blog post by the Autobox developers on comparing Autobox’s structural change detection to impulse and step-indicator saturation using the isat function in our R-package gets. (Indicator saturation is also available through Autometrics in PcGive/OxMetrics). We appreciate (and encourage) the comparison, however, indicator saturation was used incorrectly in the author’s example since they do not specify a sensible underlying regression model. 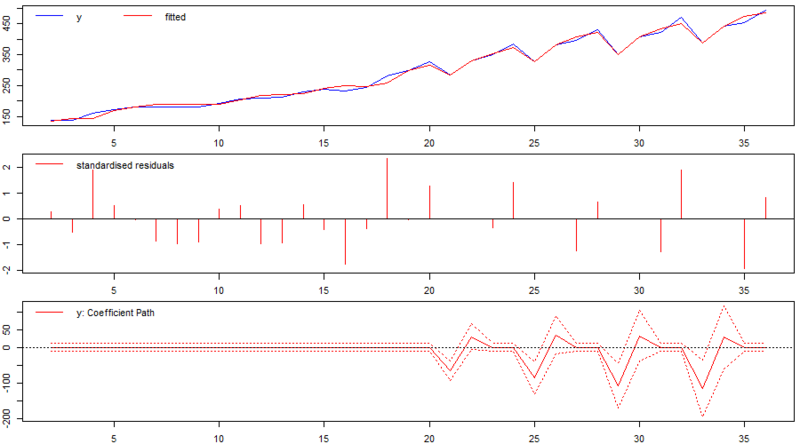 When used correctly, indicator saturation (using isat) detects the hypothesized change with no difficulty. This emphasises that the role of the econometrician/statistician in shaping the analysis using automated procedures remains vital, and must not be neglected. Here we discuss the use of indicator saturation by re-visiting the data example from Autobox to guide future users of isat and our R-package gets. The data (made available by the authors and also downloadable here) is a time series of T=36 observations with a changepoint (particularly a change in seasonality) around observation t=18. The blog authors apply isat using mostly the default settings of the function. The result – as the authors discover – is that indicator saturation picks up multiple change-points (or shifts) in the intercept and – while the second shift does coincide with the “real” change-point – the other shifts simply approximate the underlying trend of the series which was un-modelled by the authors (reproduced here as Figure 1). Seasonality is also not accounted for because the underlying regression model contains no additional variables. 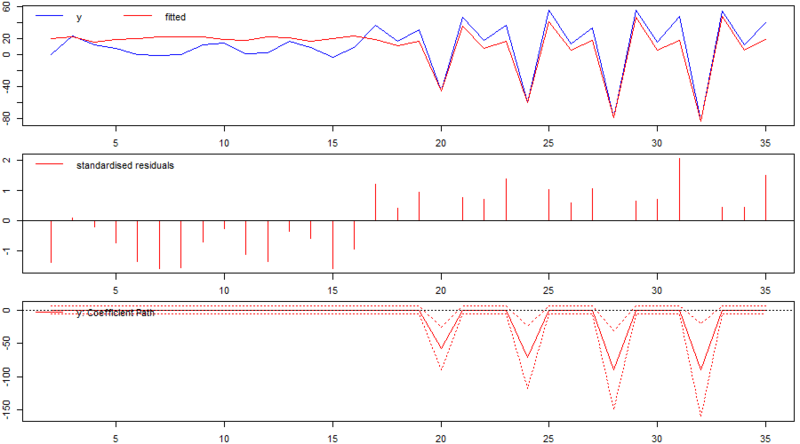 This model-misspecification is apparent when looking at the residual plot or diagnostic tests. Figure 1: Identified `changepoints’ or break when using indicator saturation incorrectly in an intercept-only model. What are the results if we improve the model specification and use indicator saturation? We include a `forced’ linear time-trend in the model specification that is not selected over (mxreg=t), and allow for impulse indicators to pick up outliers and general deviations (iis=TRUE) while, at first, not considering step-shifts (sis=FALSE). We set the significance level to allow for an expected false-positive detection (gauge) of one outlier (t.pval= 1/T). As the results in Figure 2 show, we successfully identify a structural break (or changepoint) in the time series by detecting outliers from observation t=19 onwards. This result also holds when jointly allowing for outliers as well as step-shifts at any point in time (iis=TRUE, sis=TRUE – see replication code below). Figure 2: Identified `changepoint’ or break when using indicator saturation correctly in a trend-stationary model. We initially run indicator saturation on first differences of the series including an autoregressive term (ar=1). Again, the problematic period is identified successfully (Figure 3). As impulse indicator saturation (IIS) is valid even in the case of unit-root non-stationary regressors, we also run an AR(1) model of the series in levels. As before, the problematic period is successfully identified (Figure 4). 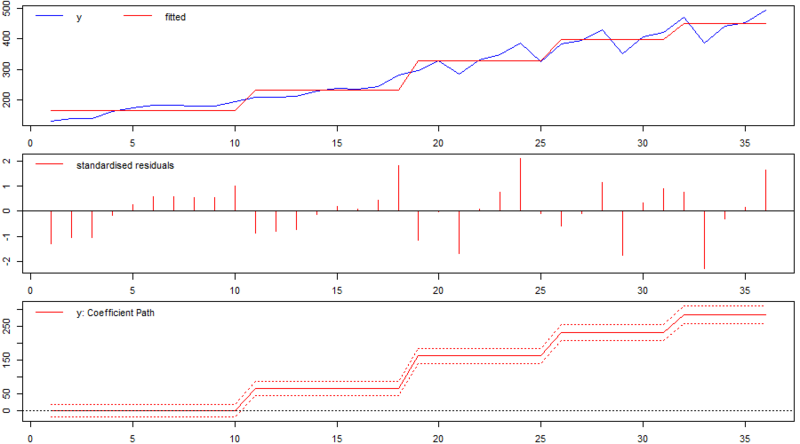 Figure 3: Identified `changepoint’ or break when using indicator saturation correctly in a stochastic-trend model in first differences. Figure 4: Identified `changepoint’ or break when using indicator saturation correctly in a stochastic-trend model in levels. Beyond the detection of outliers (or simple step-shifts in the intercept), isat in gets is flexible to allow for changes in coefficients on multiple regressors using the user-specified break variable argument (uis). For example, we could allow seasonal patterns to change using designed break functions specified in uis, while also allowing for impulse indicators and step shifts at any point in time. Here we do this by interacting a full set of step-indicators with four seasonal dummy variables and subsequently selecting over this full set of break variables. As above, the problematic period is successfully identified: both through the onset of seasonality (a seasonal indicator significantly enters the model from t=17 onwards reported as “sis17.s4” in the replication code), as well as through additionally detected outlying observations in subsequent periods. Overall, this comparison highlights the importance of the econometrician/statistician in carefully specifying regression models, and the power and usefulness of indicator saturation methods in detection outliers and structural breaks. If you would like to try indicator saturation yourself, the R-package gets is freely available and can be downloaded through CRAN or here, there is also an online demonstration using R-studio’s shiny here.